A skeleton named Little Foot is among the oldest hominid skeletons ever dated at 3.67 million years old, according to an advanced dating method. Little Foot is a rare, nearly complete skeleton of Australopithecus first discovered 21 years ago in a cave at Sterkfontein, in central South Africa. Stone tools found at a different level of the Sterkfontein cave also were dated at 2.18 million years old, making them among the oldest known stone tools in South Africa. A skeleton named Little Foot is among the oldest hominid skeletons ever dated at 3.67 million years old, according to an advanced dating method. 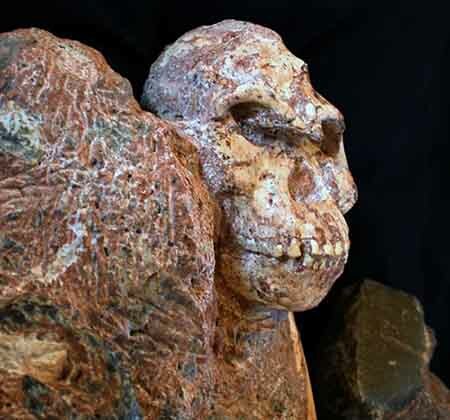 Little Foot is a rare, nearly complete skeleton of Australopithecus first discovered 21 years ago in a cave at Sterkfontein, in central South Africa. The new date places Little Foot as an older relative of Lucy, a famous Australopithecus skeleton dated at 3.2 million years old that was found in Ethiopia. It is thought that Australopithecus is an evolutionary ancestor to humans that lived between 2 million and 4 million years ago.